Acidity regulators are used to regulate the acidity of finished food products. This is done by stabilizing the pH level of the food through an internal reaction of the regulator with the food product. Apart from modifying the pH level of the food, acidity regulators can also be used to add flavour the food product. The regulator can provide a bland or a very sharp taste to the food product depending on the type of regulator used and the quantity that is used. The regulators can either be sourced naturally or be produced in a laboratory synthetically. Another interesting use for acidity regulators is for the purpose of preserving food. The regulators can increase the shelf life considerably for all sorts of fruits and vegetables. In view of the multiple uses for acidity regulators, the regulators are finding increasing demand across the globe, primarily for the ability to impart taste while also increasing the shelf life of products. A number of products are nowadays exported from the APAC market to the Americas and Europe. As such, preservatives are absolutely required in this multi- million dollar industry. The use or presence of citric acid across a number of products is in itself a key driver for the acidity regulator market as this is the key compound for which acidity regulators are used. Citric acid was initially used in certain food stuffs but is now being used across for non-alcoholic beverages as well. In view of this countries like India and China which have been seeing a considerable traction with respect to sales of non-alcoholic beverages. As such, the demand of acidity regulators in these countries is high and gaining prominence. One factor to keep in mind however is the strict vigilance by the respective food industries across the globe that are monitoring the amount of preservatives that are being added to food. The APAC region is will be the highest contributor to the acidity regulator industry till the end of the forecast period. The market will be driven by the demand for process food from India and China. On the whole, the market is expected to be close to $6 billion by the end of the forecast period with a number of Chinese players expected to make it to the top of the list of leading vendors by this period. In terms of Acidity Regulator by type the market has been divided into the following Acetic Acid, Citric Acid, Lactic Acid, Malic Acid, Phosphoric Acid and Others. 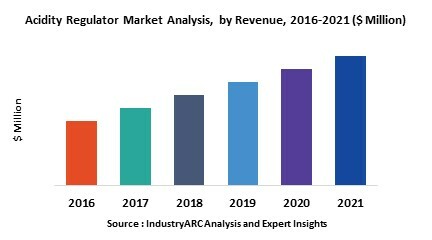 The Acidity Regulator market has also been segmented by the following application Beverages, Sauces, Dressings & Condiments, Processed Foods, Bakery & Confectionery. The Acidity Regulator market has also been segmented by the following geographies Americas, APAC, Europe, ROW.